Apple’s 3rd Quarter results were released after the close of the market today. The company easily beat expectations with income of $1.07b ($1.19 a share), 11 cents ahead of Wall Street predictions (Thomson Survey). The company also easily beat expectations on gross revenue with sales of $7.46b, a 38% year over year improvement and an improvement above analyst expectations of $7.37b. Mac sales were up to a new record level. iPod sales, which had been growing at a reduced rate in recent quarters, jumped to double digit percentage growth. It was the best June quarter in Apple’s history. Still, it wasn’t enough. Apple, citing an ambiguous product shift as partial causation, predicted a Q4 result of $1 per share on sales of $7.8b. Analysts were looking for $1.24 a share on sales of $8.3b. The stock was pummeled in after hours trading dropping near 10%. It’s an all too familiar story. A year ago, in the summer of 2007, Apple guided to decreased margins and profits as a consequence of a then ambiguous product launch too. Earnings, they forecast at that time, would come in well below the trend line. The actual numbers, however, bested the prediction substantially (guidance was 65 cents a share, actual $1.01). In Q1 2008 it was more of the same minus the new products. Last April in Q2, same ol’ same ol’ too. Apple had forecast Q2 at 94cents a share then came in at $1.09. Now, surprise surprise, wink wink, it’s more of the same. Another ambiguous upcoming product launch characterized as a “future product transition” is threatening margins. Apple is being conservative in guidance. CFO Peter Oppenheimer offered the standard line saying, "We give you guidance we have reasonable confidence in achieving." "I have guided revenue up 5 percent this quarter” he added, “We are confident in our business." Wall Street wasn’t satisfied. Doesn’t matter that it’s historically been a pattern and a non issue. Lower guidance, the street lowers the stock price. Simple truth. Adding to it, issues of Steve Jobs’ health, which previously surfaced in June, were refueling questions about Apple’s future leadership. It even came up as a direct question from the analysts. 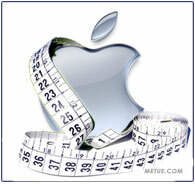 Apple declined comment saying his health is a personal matter. At this point, there’s nothing factual to indicate cause for concern. • Apple posted revenue of $7.46b and profit of $1.07b or $1.19 per share for the quarter. That is up from $5.41b and profit of $818m or 92cents a share last year. It was the strongest June quarter in the company’s history. • Gross margins were 34.8%, down slightly from 36.9%. The fourth quarter margin is predicted to be about 31.5% and 2009, approximately 30%..
• The Mac accounted for 61 percent of Apple’s total revenue. Apple shipped 2,496,000 Macs, a 41% unit increase and 43% revenue increase year over year. Sequentially the company was up 9% over the prior quarter in total units sold. Breaking out the categories: desktops accounted for 943k of the total. Laptops accounted for 1,553,000. Desktop unit growth was up 49% year over year while portables were up 37%. •iPod sales were up 12% year over year in total units 7% in revenue. In total 11m were sold in the quarter. iPod sales grew 10 percent in the U.S., and 15 percent outside the U.S. As a note, Apple explained that the iPod Touch gets a different accounting treatment than the iPhone because of its free software upgrades, which iPods and Macs don’t receive. •iPhones sold 717k on the quarter, up from 270k last year in the same period. On the negative, iPhone revenue wasn’t recognized during the quarter for any iPhone sold after March 6 because the company announced the iPhone 2.0 software that day. That was expected. Overall, the iPhone 3G is off to a fast start. More than 25 million applications have been downloaded from the App Store. •Apple’s owned stores: the company’s own retail outlets sold 476,000 Macs. The average revenue per store was $6.8 million during the quarter, with well over 200 stores open during the quarter. A store in Beijing store opened last weekend, and Switzerland and Germany are coming soon.